This almost indescribably soft natural fabric -- called susti or susdi, sometimes sousde -- is a cotton/rayon blend woven only in Morocco, and is just about as yummy as cashmere... and that's what makes our IBRI the perfect pants for so many figures! They're simple, elegant, and comfortable, too -- tapering slightly towards the ankle, a somewhat narrower silhouette than the more harem-y styles you'll find here. 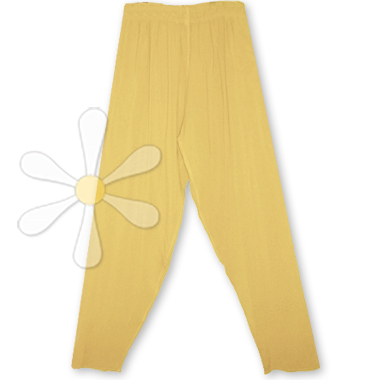 They feature a wide elastic waist, stitched in three individual rows for extra comfort and have side seam pockets. French seams reinforce the superior durability. In other words, the perfect pair of pants! A great foundation to build your own unique look... you're extraordinary, express it every day. Why not?